Once Upon a Tide and Other Brand Fairy Tales — Anna Akbari, Ph.D.
You may not think you’re a brand whore, but even the least materialistic consumers are susceptible to brand bias. New York Magazine recently did a piece on Tide detergent and its rise to prominence on the black market, due to its strong brand presence. Its nickname, “liquid gold,” is fitting, as it sells for twice as much as the average detergent, and many will seemingly do anything to ensure their clothes are kissed by Tide’s magical suds. Beyond its relative cleaning power, using Tide is a badge of honor: it says that you are a good parent, someone who invests in themselves, someone who’s “made it.” Tide has come to be synonymous with “success”’ – or at least the perception of success. Obviously, Tide isn’t the only brand that signals social status. A quick glance at the LVMH portfolio alone speaks to the power of luxury branding and marketing. The amount of money we’re willing to exchange for an item is not usually proportional to its utility or functional value. We invest not only in things, but in brands, because those brands become an extension of who we are. We are commodities, and our association with other commodities significantly enhances (or diminishes) the desirability of our personal brand. We long to be “liquid gold” incarnate. But how do we go from being a generic product to flying off the shelves? How do we build a personal brand (without taking ourselves so seriously that we become a sad version of this guy, amusingly mocked by The Onion)? Self-branding is not a new concept – and social media is a perpetual reminder of our power to shamelessly self-promote – but it’s important to revisit what it actually means to construct an identity and market it. What is the relationship between the visual you present and the substance you deliver? To whom do you want to appeal? What will determine how much they’re willing to invest? Create a plan of action: Reflect on your personal vision, assess your assets, and identify goals accordingly. The SelfBrand Assessment Test is a great place to start. 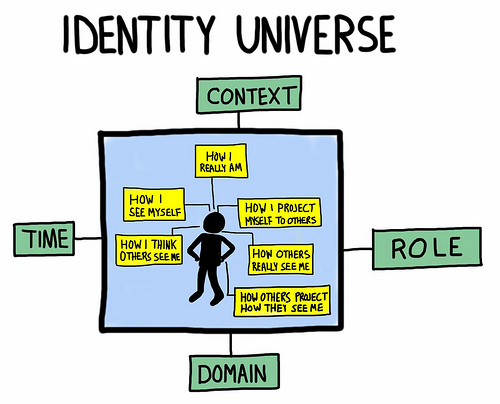 Mindfully manage your virtual identity: Your virtual self is a real self, and it requires grooming and maintenance. Consciously align your virtual and embodied selves. If people sense a disconnect or witness inconsistencies, your stock goes down. Feeling overwhelmed by multiple profiles? Follow these steps and diminish multiple identity stress. Have realistic expectations: No product is perfect, and you’re no exception. Quirks and hiccups are endearing. So remember to at least handle yourself with the same care you do your laundry.